But obviously it made sense to get a professional view, and I accordingly checked. I was told initially, after a quick glance, that it had ‘some strange faults and audio is definitely dubbed from the lady and the blue sheet with a dead body at the end of the movie’. The footage seemed to have been ‘Initially taken from a high quality camera’ which the makers had then tried to transpose ‘to mobile format and while trying to do this all the audio got badly compromised’ – which was precisely what had happened with regard to the Channel 4 footage. This made even more suspicious the determination of Daran to claim that the Channel 4 film had not been edited at all. He kept insisting that it had been ‘authonticated’ but he was unable to say by whom this had been done, and only said that Channel 4 had said it had not been edited. Later, after the meeting, he claimed that it was something called ‘the American Institute of Technology’ that had ‘authonticated’ the film, but he was not aware of the report commissioned by the United Nations which said that the footage had been edited, and edited backwards with additions from another time or another place. This is what makes laughable the assertion of the official inquiry into the Channel 4 film, which says again and again that ‘Channel 4 showed that the material broadcast showed no sign of manipulation or fakery’. It seems clear that that inquiry did not look independently at the material, or read the UN report itself. If I am wrong, it is obvious that the inquiry clearly had pretty low standards, given too that they completely ignored the suspect frames in the Channel 4 video, 17 of them, that the UN report had identified. When a video is being used as evidence, even a single frame being suspect puts it beyond the pale. The investigation into the recently received clip that I asked for reported after further analysis that the video and the audio were ‘taken from a DVD ( PS – Program Stream — Here video streams and audio streams are different files). The video was re-encoded to Mpeg1 but the audio was left untouched ‘with very high quality. It went on to say that the ‘Video camera is definitely very high quality and even after Mpeg1 ( which is low encoding standard) video is remarkably high quality. Why Mpeg1 is a mystery and it may be some one thought mobile video is mpeg1’. This is not the case but the final video got mobile video resolution, indicating an attempt ‘to get final video as mobile camera format’ – which is of course what we saw with the Channel 4 film. The game there was given away most obviously by what the UN commissioned expert report said was an optical zoom, which it seems is not available on mobile phone technology. The investigation I asked for noted that ‘One thing is sure, they are now trying to move into more professional domain to do the editing… Although they are still amateurish … End of the video got more info which does not show if you play…’ I suspect therefore that we will hear lots more in the future of Daran and his work, unless he is investigated thoroughly for his links with the LTTE, with Siobhain McDonagh, and with Channel 4. But I suspect that will not be done, since the resurgence of terrorism so long as it does not affect Britain is not of much interest to British authorities, and they will only be shocked into realizing the interconnected reach of terrorism when they feel under threat themselves. Meanwhile the media will continue to regurgitate what terrorist propagandists send them. In Australia for instance I was sent by ABC, on the morning I arrived, what purported to be shocking photographs. They wanted to ask me about them, and indeed some of my friends in Australia suggested I refuse since I had little time to prepare. But knowing that, if they were like Channel 4, they would use this to say we refused to comment, I agreed, and then spent a few minutes studying the photos. There were three subjects. The first was covered in nine photos, which showed a dead body surrounded by several soldiers. There was no indication that they were connected with the cause of death. The second was just a boy hanging, which was a horrifying picture, but connected with nothing else. The bit about the pictures was completely omitted. ABC also failed to send me a tape of the whole interview, though this had been promised by the camera crew while I was being interviewed. Most worrying of all were the last three pictures, which were of a man being tortured. He was surrounded by men in military uniform but, unlike in the case of the first nine pictures, no faces could be seen. Even more tellingly, while boots could be seen on a couple of people, one man was wearing rubber slippers. 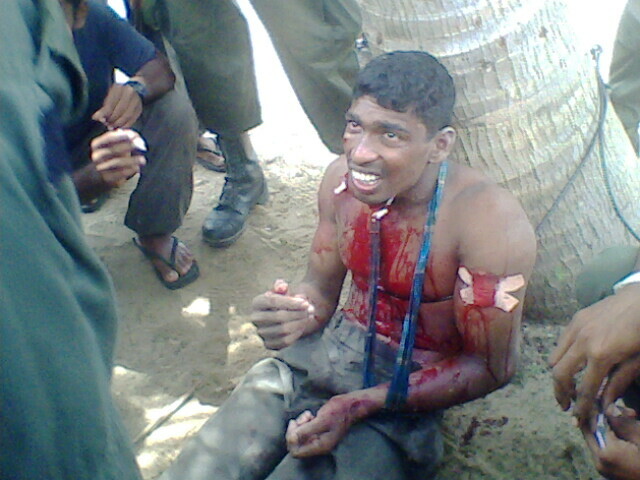 There are several LTTE videos on youtube which have characters, often doing gruesome work while wearing rubber slippers. The chances are then that this is an extract from another of these. I did not argue this point, but simply pointed the glimpse of the rubber slippers during the interview with ABC news. They told me the interview would last about a quarter of an hour, but it went on for much longer, and it seemed from the tone that they saw their questions about the pictures as what would be their centerpiece. When I pointed out the rubber slippers to them however, they seemed deflated. Needless to say, when the interview was finally broadcast, it was restricted to a couple of minutes, with much more space given to hostile speakers such as I think Gordon Weiss, who had just begun to tout his book. The bit about the pictures was completely omitted. ABC also failed to send me a tape of the whole interview, though this had been promised by the camera crew while I was being interviewed. I cannot help feeling then that the whole exercise was designed to trap me, assuming that I would issue a blanket denial, which sadly is what some Sri Lankan respondents do when faced with difficult questions. ABC or its informants would then have triumphantly proved that the first nine photographs were genuine, and gone into what Richard de Zoysa would have described as a feather dance about a state of denial. That scene of torture provided I believe a centerpiece too for the Channel 4 film that was telecast in June. Certainly the man from the ‘Times’, who came to the House of Commons meeting with a girl from Channel 4, thought that was the scene to which it was most important that Sri Lanka respond. After I pointed out the mixing of the photographs, which I suggested was the same technique Channel 4 had applied, using fraudulent footage mixed with what was true, hoping we would make blanket denials, he seemed more civilized, stopped interrupting, and even stayed on to talk to Sri Lankans at the reception that followed. Conversely, the Channel 4 girl fled, having refused to answer questions about the discrepancy between the UN experts’ view and what Siobhain McDonagh’s researcher had claimed about nothing having been edited in the Channel 4 film. So many falsehoods, so much manipulation. But there will be no investigation of what all this is about, no effort to explain why Channel 4 refuses to tell even the UN who sent them the footage they have so proudly displayed, no attention to the manipulation that has been admitted even though Channel 4 and Siobhain McDonagh’s researcher claim there was no editing.